WeTap now has new completely open-source data, different icons for broken and working fountains, improved global mapping, and a fast load time. It is available to Android users who want to beta-test it and provide feedback for improvement. The new WeTap app can be downloaded here. WeTap makes the public water fountain easy to find – and helps add new ones to the public data base. Valuing tap water – both the quality and access – is an important step to ensure our water remains safe, tasty, and protected. 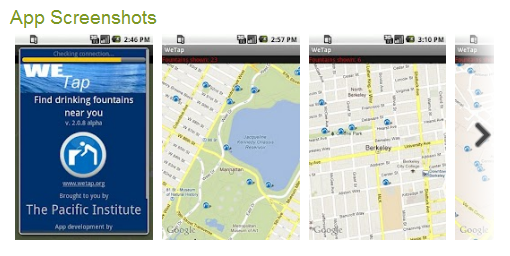 Download it and start mapping fountains today! Go to the Android Market.